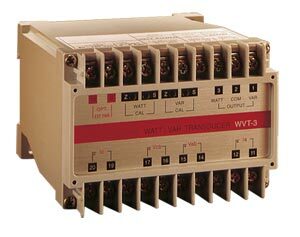 The DRA-WVT-3 Series combines watt and VAR transducers in one compact housing. Two simultaneous proportional dc current outputs are provided for watt and VAR parameters. The polarity of the watt output is positive for unity power factor (PF); polarity for the VAR output is positive for lagging power factor. 참고: * Consult engineering for 50 Hz and 400 Hz models. Comes with complete operator’s manual. ** Models with ±1mA or ±20mA outputs are also available. Consult engineering.